This is the place where you will find the answers to most of your tech queries, so subscribe and stay in touch. Suggestions and Questions from viewers are always welcome !! Megabytes, Gigabytes, Terabytes... What Are They? Add an article to this website! Truth be told, there wasn’t all that much secrecy left, as leaked images had already surfaced from all places, revealing the more intense metal design of the new HTC One and its one key feature - a “Duo” camera on its back. There was some, though, as we had seen a lot of still images and a very short video, but nothing like a full-on video preview. Moreover, in the following days, more such short videos surfaced and we even saw a concise walkthrough of HTC's Sense 6.0 user interface. So what can we say now, what will the new HTC One look like? Read on to find out our recap of all its new features, a look at the “Duo” camera and what it could offer, as well as specs and release date. The all new HTC One will be the first phone to feature two cameras on its back. We have actually already seen smartphones with dual rear cameras, but their goal was 3D photography, while the cameras on HTC’s new big thing are said to contribute to improving traditional 2D photography rather than 3D. The actual process of taking a photograph on the new HTC One actually looks pretty much unchanged - you see a single image through the viewfinder and you tap on a button to capture a picture. The actual benefits of the dual camera become visible once you open a captured image, as you can apply “Duo effects” to the picture. We’d also guess that HTC has bundled in effects like post-capture focusing, a depth map and the possibility to erase objects from an image, but we are yet to see a confirmation about these features. The other changes in the actual shooting process should be in faster focusing and a more pronounced depth of field effect. We have also seen demonstrations showing how the two rear cameras can be used to achieve lossless zoom, but we don’t know whether the camera in the new HTC One will have this feature on board. The camera interface is also overhauled, and now you can select from six main shooting modes. The regular camera and video modes are what most consumers will use most of the time, but there is also a “Zoe camera”, “Selfie”, “Dual capture” (recording simultaneously on your front and rear cameras), and a “Pan 360” (360-degree panorama) mode. HTC is also said to still use UltraPixel technology, but in an improved form. That's good news, as we have found the current UltraPixel camera on the HTC One to be sub-par to its peers. With so many leaked images, it seems clear that the new HTC One will feature a design very similar to the HTC One, with two front-facing speakers and an aluminum unibody, but with an even more intense metal finish, with more pronounced metallic texture. The all new One should feature a slightly larger, 5-inch display with a resolution of 1080 x 1920 pixels. Rather than having capacitive navigation keys below the display, the new flagship will sport on-screen buttons. 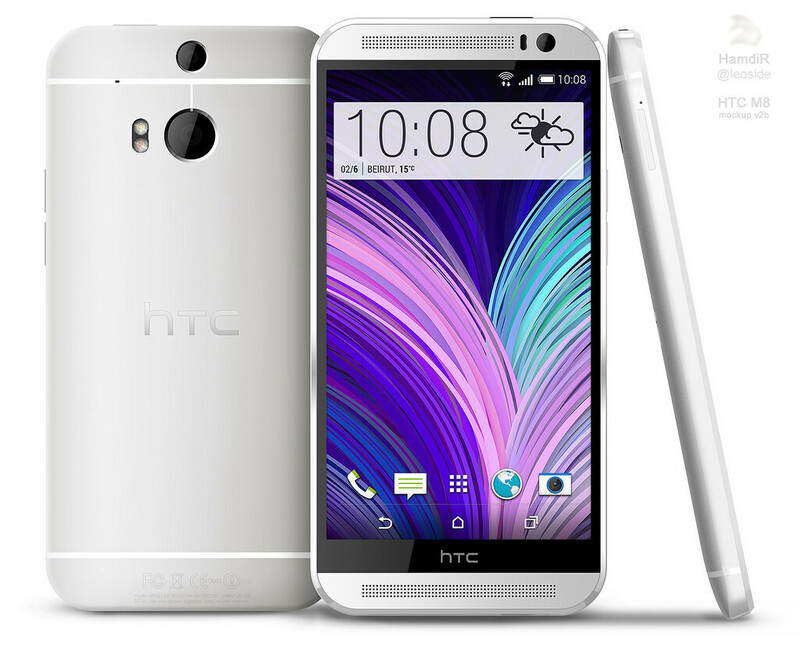 All in all, the new design looks just a bit larger (both wider and taller) than the 2013 HTC One. The new HTC One is expected to ship with the latest Android 4.4 KitKat on board and a re-imagined Sense user interface on top of that. The new Sense is expected to carry the 6.x version, but it is not a huge change over the current one. The most interesting new feature seems to be the added support for 'Motion Launch gestures' like double-tap to wake the phone's display. The BlinkFeed news aggregator is still a swipe away (but it’s been improved), and now you can swipe twice to see its contents by category. The overall visuals have not changed much either - you still have a vertically scrolling app drawer, dark backgrounds and a similar aesthetic. The two biggest changes are in the camera app and the settings menu. The camera app now has large, round icons that are easy to tap on, and in settings the icons have also been simplified, getting that trendy, flat styling. Under the hood, the new HTC One is expected to ship with a quad-core Snapdragon 801 system chip (likely, the MSM8974-AB version of it) with 2GB RAM. This is the same chip that powers devices like the Samsung Galaxy S5 and the Sony Xperia Z2, (the Z2 has slightly more RAM - 3GB) so it should be more or less on par with the top performers. We’re yet to see detailed benchmarks, but it is only logical to assume that the handset will run even the most demanding of games with ease. The new and exciting thing under the hood is the added support for expandable storage. The new HTC One should come with a microSD card expansion slot (the current model does not support microSD cards), so you can expand the storage freely. HTC has already set the date for the official unveiling of its next flagship - it’s March 25th, with events simultaneously taking place in New York City and London. The new HTC One has also cleared FCC certification recently, and we have all reasons to believe it will arrive on all four major US carriers - Verizon, AT&T, Sprint and T-Mobile - as well as internationally. With all this information, do you feel ready to break the piggy bank and grab HTC's upcoming new big thing? Primary and extended partitions are the main disk divisions; one hard disk may contain up to four primary partitions, or three primary partitions and one extended partition. The extended partition can then be further divided into any number of logical partitions. The illustration below shows a hard disk that contains four main partitions: three primary partitions and one extended partition. The extended partition has been further divided into two logical partitions. Each primary partition has been formatted to use a different file system (FAT and NTFS). The two logical partitions have both been formatted to use the FAT file system. A primary partition may contain an operating system along with any number of data files (for example, program files, user files, and so forth). Before an OS is installed, the primary partition must be logically formatted with a file system compatible to the OS. If you have multiple primary partitions on your hard disk, only one primary partition may be visible and active at a time. The active partition is the partition from which an OS is booted at computer startup. Primary partitions other than the active partition are hidden, preventing their data from being accessed. Thus, the data in a primary partition can be accessed (for all practical purposes) only by the OS installed on that partition. If you plan to install more than one operating system on your hard disk, you probably need to create multiple primary partitions; most operating systems can be booted only from a primary partition. The extended partition was invented as a way of getting around the arbitrary four-partition limit. An extended partition is essentially a container in which you can further physically divide your disk space by creating an unlimited number of logical partitions. An extended partition does not directly hold data. You must create logical partitions within the extended partition in order to store data. Once created, logical partitions must be logically formatted, but each can use a different file system. Logical partitions may exist only within an extended partition and are meant to contain only data files and OSs that can be booted from a logical partition (for example, Linux, Windows NT, and so forth). On an IDE drive, the first drive is called hda, and the partitions are shown as hda1, hda2 . . . . etc. etc. Your second drive is called hdb. On a SCSI drive, the first drive is called sda, the partitions are sda1, sda2 . . The second drive is called sdb. An extended partition is the only kind of partition that can have multiple partitions inside. Think of it like a box that contains other boxes, the logical partitions. The extended partition can't store anything, it's just a holder for logical partitions. The extended partitions is a way to get around the fact you can only have four primary partitions on a drive. You can put lots of logical partitions inside it. You will never see hda4 mounted, just hda5 and hda6, in this case. Note that Linux numbers primary partitions 1-4, logical partitions start at 5 and up, even if there are less than 4 primary partitions. You will only need one swap partition as that can be shared by the various distros. May I suggest using one partition for the OS(active primary) and the rest will reside in an extended(primary) as logical partitions. The extended partition will be hidden(this doesn't matter, as it's only the container for the logicals), but all of the logical partitions will be visible. Booking tickets from IRCTC is the most hectic process for every Indian passenger who wants to travel through Trains. Because IRCTC is the only official website to book train tickets in India, that’s why it takes much time to book a train ticket. This will be double while booking tatkal tickets because most of the people book tickets suddenly by using tatkal scheme. IRCTC website have 12 million unique visitors per month and most of the people will be on website between 10AM to 12 PM. Because it is the time to book tatkal tickets online, actually most of the tickets sold within one hour. Straight to the point here I mention few useful methods and some important tips to increase the chances of getting tatkal tickets before site getting down. Magic Auto fill is a bookmarklet created by Amit Agarwal, founder of www.labnol.org website. This tool will be a handy thing to book tatkal tickets quickly. Actually this tool doesn’t book tickets but it helps you to complete the booking process lesser than before. Check here how it works. 1. First go to this website www.ctrlq.org/irctc and click on “fill reservation form” button and fill all details which are necessary while booking a ticket on irctc website. 2. By using this form you can book tickets for 6 adult passengers and 2 child passengers. Once you fill all the details, enter your mobile number at the end of form. 3. Now click on “I’m Feeling Lucky” button and you will get magic auto fill bookmarklet. Drag it into your browser bookmarks tab. 4. Now open IRCTC website and navigate to booking section, click on magic autofill bookmarklet to complete ticket booking. (Here you need to do things quickly because you’ll miss tickets in seconds of time). As the name suggests user agent switcher changes the user agent of browser into desired format. Here we use this for tatkal ticket booking. This extension available for both chrome and Firefox browsers. 1. First of all you need to download user agent switcher extension from the below link and install it on your chrome browser. 2. Once installed it will be placed beside the wrench menu of chrome browser. Click on that icon and change the user agent to any mobile platform. Here I use android mobile user agent. 3. Logic is simple, we have speed internet connection but it doesn’t work with IRCTC website. So we browse the same website through mobile platform to book tickets quickly. 4. Here we browse IRCTC website in mobile platform with pc internet connection. I doesn’t guarantee about this method because it have 50-50 chance but you will give it a try. The main thing we consider while booking tickets from IRCTC website is you need to keep page active otherwise it shows a message session expired. So to prevent from these things you need to do some quick operations while perform ticket booking. To keep session alive for long time you need to do one tricky thing that is copy the link from IRCTC website General Section and select “Terms and Conditions” and paste the link on another browser. For example if your book tickets on chrome then open the below link on Firefox browser and refresh that page for every 2 or 3 minutes. Note down each and every information which are necessary while booking tatkal tickets. Noting down on paper is a time taken thing so you can take help of auto form filling add-ons and extensions from both browsers. Now days everyone shows the ads on their website, IRCIC also shows the ads on their site and also contain the images and maybe some Java scripts which slow your online Tatkal booking process. You have to use Google Chrome or Mozilla Firefox browser because they are the fastest browser and take very less time load websites. Please follow the below links to install Ad block on your Web browser. Instal Google Chrome or Mozilla Firefox. By following the above link install the Ad block on your web browser and block the ads and other Java scripts which slow the IRCTC website. It is common that when we wants to book online Tatkal ticket on IRCTC we logged in IRCTC account before 10 AM, but when Tatkal booking started, we click on sites it shows session expired, It means you need to login again but now it’s very hard to Login during Tatkal timing. IRCTC generally Logged out your account if you are not using it from last 3 minutes, So if you want to book tickets you have logged into your account before 10 AM and for the solution of “Session Expire Error” I will show you the fantastic way. There is one plugin available named “Auto Refresh” on Google Chrome and Mozilla Firefox both web browser, This plugin refresh your web pages automatically according to your given time period. Follow the below steps to install the Auto Refresh Plugin. 4) After that plugin will install automatically. 5) Now when you open the IRCTC website, you will see the one icon on address bar. 6) Simply click on that icon and set the auto refresh time (In seconds) and click on start. While booking tatkal tickets from slow internet connection is not possible in future days also, even it is also a time taking process in fast internet connection too. So follow the above tips to book tickets from IRCTC website. This post is about Telegram for PC or Telegram Messenger for PC. Those who do not know Telegram is an Android, iOS and Windows app which is a messenger. We have seen WhatsApp taking the world by storm. WhatsApp rocked because it was simple and fast. Other alternatives of WhatsApp like Wechat, Line came and went but WhatsApp stood up against them. You can use WhatsApp for PC & WeChat for PC. Now, Telegram messenger is doing the same thing as WhatsApp. It is similar to WhatsApp and has some positive points. The best thing is that Telegram is available for PC, So you can easily download Telegram Messenger for PC (Windows). You can download following Android apps for PC. You can send messages with internet on Telegram. You can send pictures with Telegram Messenger. You can see when your friends were last online. A PC client is available so you can easily use Telegram on PC. The verification process is easy. Install the .exe file on your Windows PC. Open the installed Telegram Messenger application and Click on start messaging (Make sure you are connected to Internet). On the next screen it will detect your country automatically and ask for your phone number. Register a new number or enter the old number if you already have a Telegram account as shown. It will send you a pin on the phone number for verification. Now , your account will be activated. Enter you details by going to settings and upload a profile picture and customize the options according to your choice. You could send your queries/issues faced to Snehal [at] TechProceed [dot] com. Congratulations, You have just Installed Telegram on PC (Windows). Share this article with your friends and let them know about this cool app.